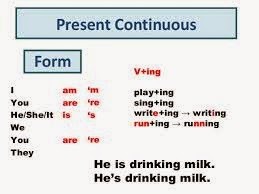 We use the Present Continuous Tense to talk about activities happening now. Examples : The kids are watching TV. I am sitting down, because I am tired. I am not learning German, because this is an English class. We can also use the Present Continuous Tense to talk about activities happening around now, and not necessarily this very moment. Examples : Sally is studying really hard for her exams this week. I am reading a really interesting book now. 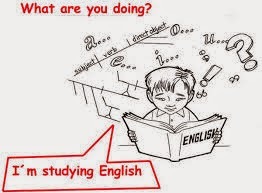 How are you brushing up on your English for the trip? We aren’t working hard these days. Examples : I am seeing my dentist on Wednesday. Sshh, I'm trying to hear what they are saying . We're looking for a new flat . 1.I don't usually have cereals for breakfast but I'm having some this morning because there is nothing else. 2.I often cycle to work but I'm taking the car this morning because it's raining very hard. 3.I'm thinking about having my hair cut short but I don't think my husband will be very happy about it. 4.My parents live in OURZAZAT but I'm just visiting it.